To get started, I would lick a spot on the skin, sprinkle some salt on it where it was wet and bite! Sprinkling a little salt on each bite, I devoured every tomato except one! There must have been a dozen in that sack! 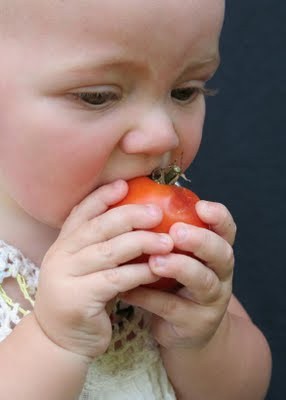 When my grandfather got home, my grandmother fussed at him for not bringing home any tomatoes like she asked. He said he did and that he had given them to me to take inside. They both looked at me and fell out laughing when they saw my rather sheepish look! ;-} Each summer to this day (when I have access to them), I grab a salt shaker and my very first "homie-grownie" of the season and eat it the same way I did that day...just like an apple! Some things are better left unchanged! 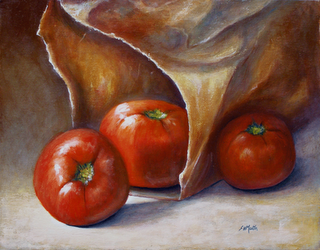 At the beginning of each tomato season I crave BLT's made with home-grown tomatoes. Ok, I know everybody knows how to make a BLT. However, I'm posting this for three reasons: 1. 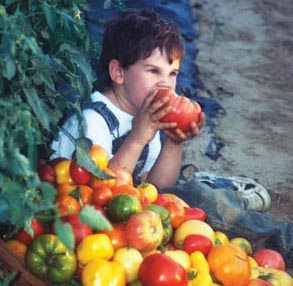 The entire time I lived in the desert (8 years), I did not have a single home-grown tomato; 2. I LOVE home-grown tomatoes and BLT's made ONLY with home-grown tomatoes; 3. I save the bacon grease for another summertime recipe: Southern Fried Corn! Put bacon on to fry. If making three or more BLT's, you can place the bacon on a rectangular cookie sheet and bake it in the oven! This way you can cook more bacon all at once! While the bacon is cooking, peel and slice the tomato. 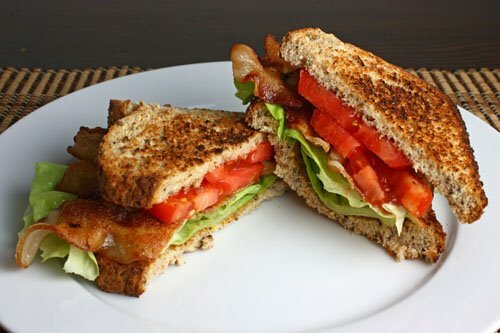 I only use Beefsteak or Big Boy's for my BLT's as they are just the right size for the bread. 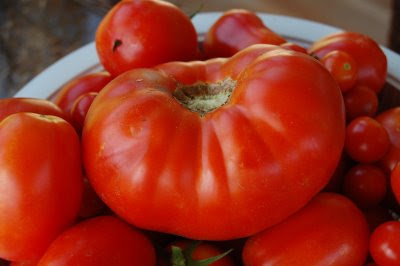 Core the tomato, peel it, slice it into 4 thick slices and salt and pepper each slice. To peel the tomato, use the back of a paring knife, firmly run it all over the tomato skin to bruise the tomato. This releases the skin from the meat thus making it easy to peel (See Tips and Information for more info on how to peel a tomato). When bacon is cooked and draining, toast the bread. When the toast is ready, slather it with Hellman's and assemble your BLT! FYI, Hellman's is the closest you'll get to homemade mayonnaise with a commercial product. If you plan on making Southern Fried Corn, save your bacon grease. Place about 3 tbl in a small plastic container or condiment jar and refrigerate. It can also be kept in the freezer until you are ready to use it!